Steven Yeun will voice Mark in Invincible. The Walking Dead creator Robert Kirkman is not messing around with the voice cast for his upcoming Amazon animated series, Invincible. Are you ready for this? The show will include the voices of Steven Yeun (The Walking Dead), J.K. Simmons (Counterpart), Sandra Oh (Killing Eve), Seth Rogen (Knocked Up), Gillian Jacobs (Community), Andrew Rannells (Girls), Zazie Beetz (Deadpool 2), Mark Hamill (Star Wars: The Last Jedi), Walton Goggins (Ant-Man and the Wasp), Jason Mantzoukas (The League), Mae Whitman (The Duff), and Chris Diamantopoulos (Silicon Valley), to name but a few. So, no big deal. Just an outstanding mix of Oscar winners, genre legends, comedy icons, superheroes, and more. Yeun, who previously worked with Kirkman on The Walking Dead, will voice lead character Mark Grayson, a seemingly normal teenager whose father, Omni-Man (Simmons), is the world’s most powerful superhero. Mark doesn’t think he has powers until his 17th birthday, at which point he begins to learn the family trade, with shocking results. There’s no word on which characters the others are voicing. 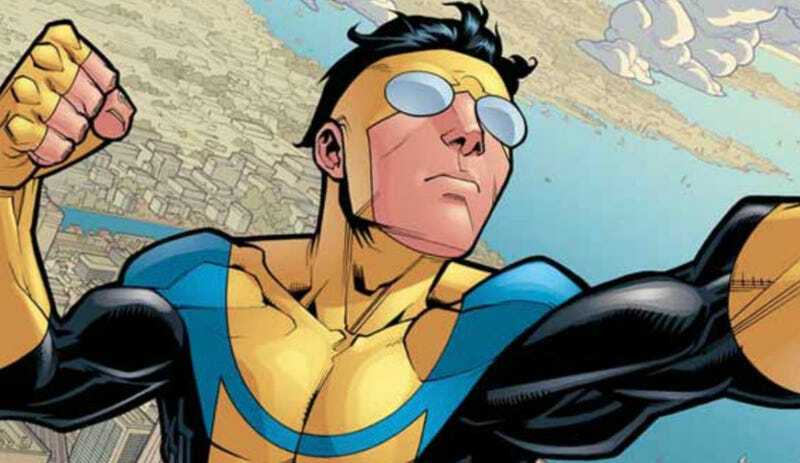 Described as “an adult animated superhero show,” Invincible will consist of eight hourlong episodes, premiering sometime in 2020 on Amazon Prime. It’s based on the Image comic of the same name by Kirkman, co-writer Cory Walker, and artist Ryan Ottley.